starts at the corner of Santa Monica and Ocean Boulevard about a half a block away. There was a time, back before motel cloning was popular, when hotels and motels had distinctive looks and themes. You can still find many of them along the Route 66. 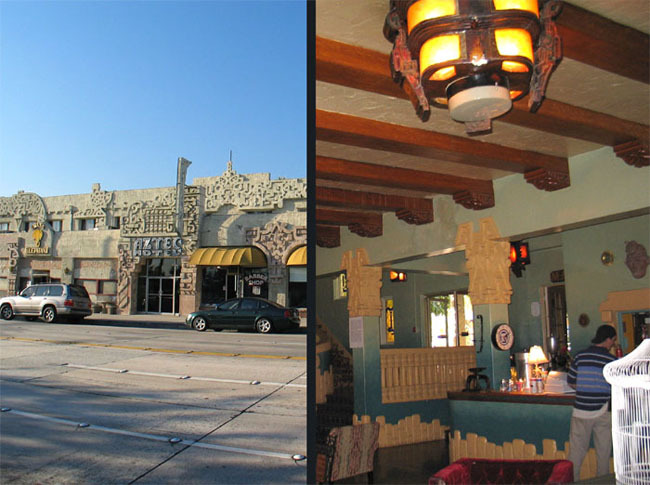 Just east of Pasadena in Monrovia is this gem, the Aztec Hotel. This unique hotel, designed by Architect Robert Stacy-Judd & Associates, has had some major renovations and its new lobby is quite spectacular. It’s well worth a walk through. 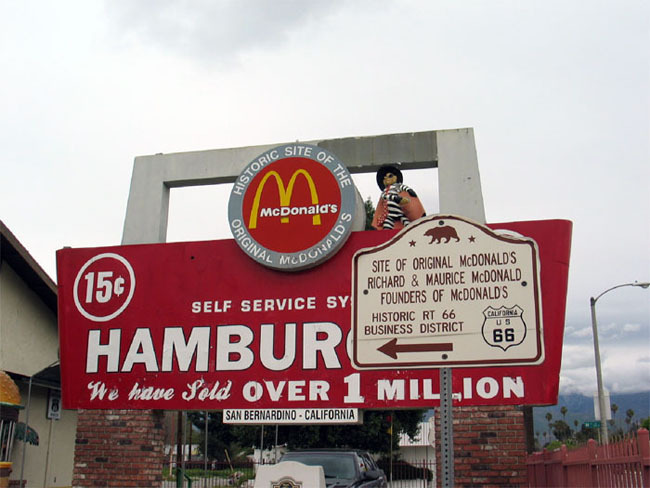 San Bernardino is the site of the McDonald brothers Barbeque Restaurant founded by Maurice and Richard McDonald in 1940. It’s right here on Route 66. You can find the oldest surviving McDonald’s franchise in the world, the McDonalds we are all familiar with, the ones with the golden arches and “speedy” logo, in Downey California. But that’s not anywhere near the Mother Road. 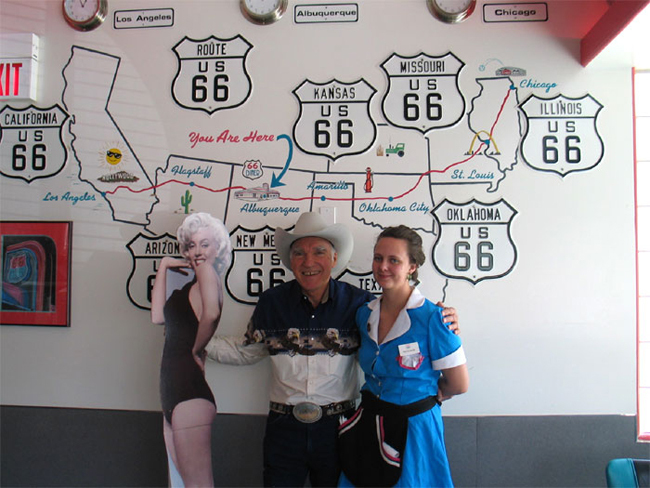 The Roy Rogers Museum used to be on Route 66 in Victorville CA. It has since moved to Branson, MO. 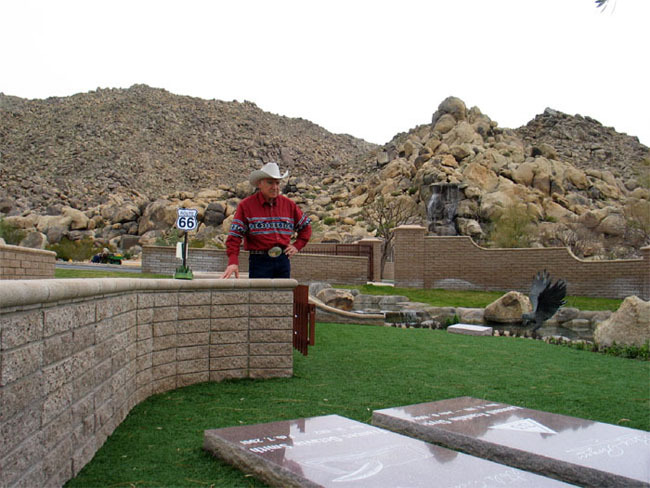 However, Roy and Dale are still here, buried together in this beautiful little cemetery nestled in the rocks outside Apple Valley, CA., just a few miles east of Victorville. I usually stop by to pay my respects whenever I’m in the neighborhood. I find the standard rubber stamp McDonald’s architecture boring so I’m always on the lookout for something different or unusual in a McDonald’s franchise. 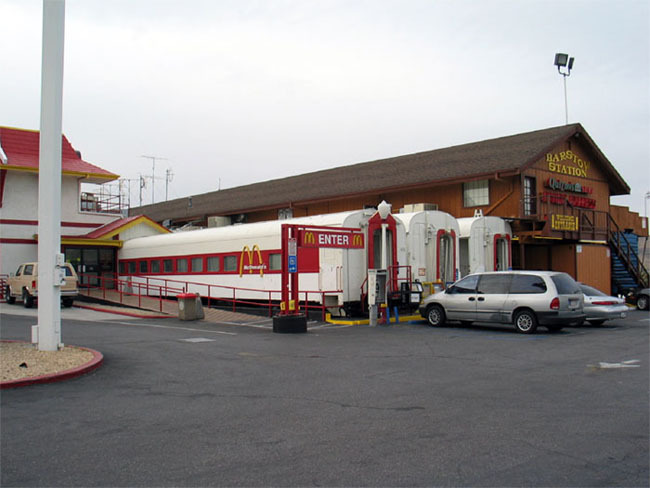 Here in Barstow, CA., I found this Pullman train car McDonald’s. It’s one of the most unusual I have ever seen. Besides getting the usual burger and fries you can also purchase some Route 66 souvenirs. 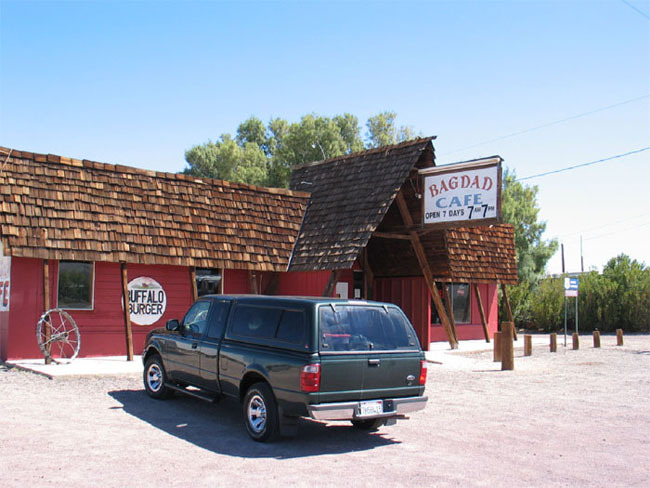 This is the world famous Bagdad Café. It was featured in the 1987cult classic film Bagdad Café. The place looks just like it did in the film with strange and interesting people still hanging around. Its fame is much greater in Europe and Japan than it is in America. Many Japanese and German tourists come in rental cars and Harley Davidson motorcycles just to see life imitate art here in this small shake-roofed diner in the desert. The food is good and the atmosphere is outstanding. A few miles east of Amboy, CA. is a long straight stretch of Route 66 known as Rock Ffiti. Tourists from all over the world use rocks to spell out messages along a fifteen-mile embankment next to the road. There is a fiber optic cable buried along the shoulder of the highway and every quarter mile or so there are “call before you dig” signs. If you leave a message that you want to share, these signs make wonderful bookmarks. Just take note of the sign number nearest your message and others will be able to find it. 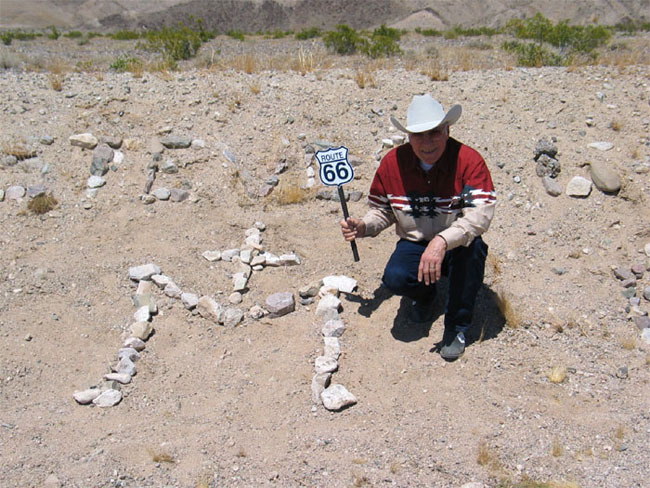 I left my Cross over “M” brand near sign post 5-58, which is about 4.6 miles east of Amboy. Route 66 winds its way up through the gold mining region of western Arizona where you find the small rustic gold mining town of Oatman. When the mines finally played out the miners turned loose their pack burros and headed back down the mountains. 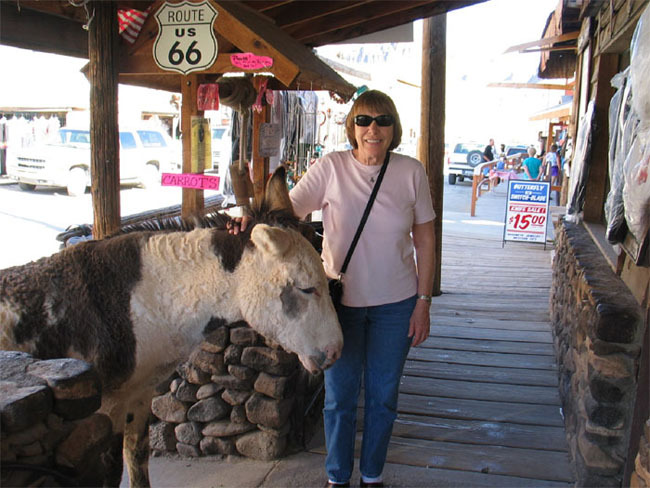 The descendants of those old pack animals survived in the wild and now roam the streets of Oatman looking for carrot handouts from the tourists who pay local merchants $1 US for each carrot. Small folk art style souvenir shops and ice cream and hamburger stands like this one in Seligman Arizona, popped up all along Route 66 after it’s decommission in 1977. They’re fun to look at and the hamburgers and malts are usually very good. 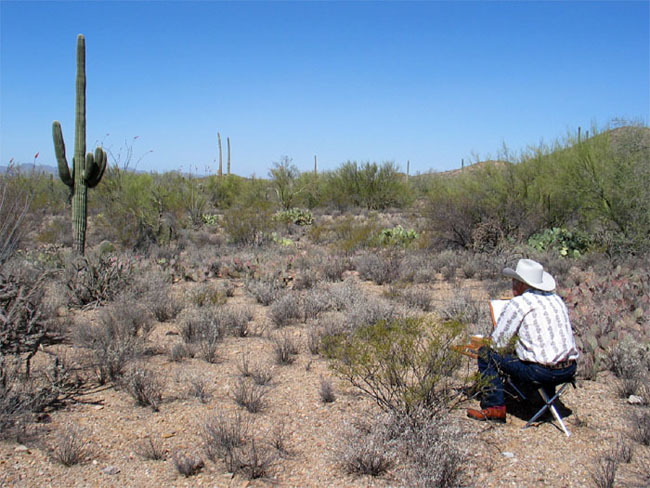 Western Arizona is where you’ll find forests of Saguaro Cactus. This majestic cactus can grow forty-five feet tall and live up to two hundred years. It’s the most beautiful and most recognizable of all the cacti in America. This was once a truck stop, trading post, and diner,— abandoned now it slowly crumbles and decays into ruins. It reminds me of the Anasazi ruins in Arizona and New Mexico. 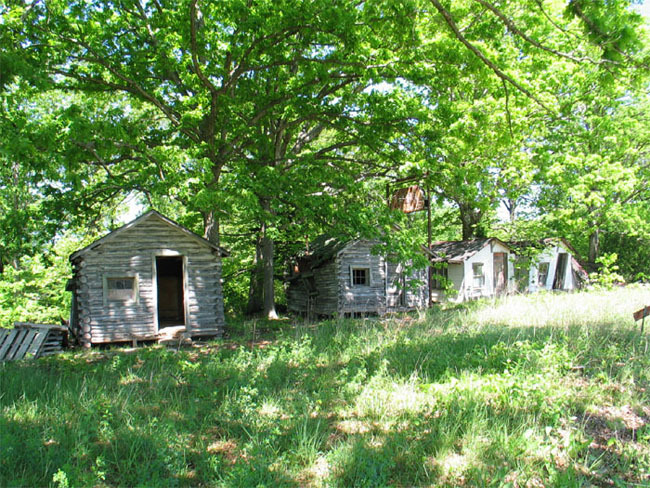 This “mercantile ruin” is typical of hundreds of businesses that have gone bust along 66. There should be at least one that is preserved as a ruin to show future generations how highway planning can affect the economics along its path. Thriving businesses went bust in a single day when highway 66 was rerouted. This phenomenon is part of American history. Twin Arrows could be a perfect representation of that phenomenon. Nothing says Route 66 more than the sight of a Wigwam Motel. There are two on the Mother Road, one in San Bernardino, CA, and this one in Holbrook, AZ. Although Americans love to photograph them they seldom spend the night in one. Americans want what the big-box motel chains have to offer: phones, microwaves, recliners, refrigerators, breakfast, and heated pools, so they stop, take a photo, and drive on. However, we found our “teepee” had a toilet, shower, flat screen TV, heat/air conditioning, two double beds, and room to spare for Alice, myself, and all the gear I travel with. The room was exceedingly clean, well appointed and cozy. You actually feel like you are sleeping in a wigwam not a glorified prison cell. 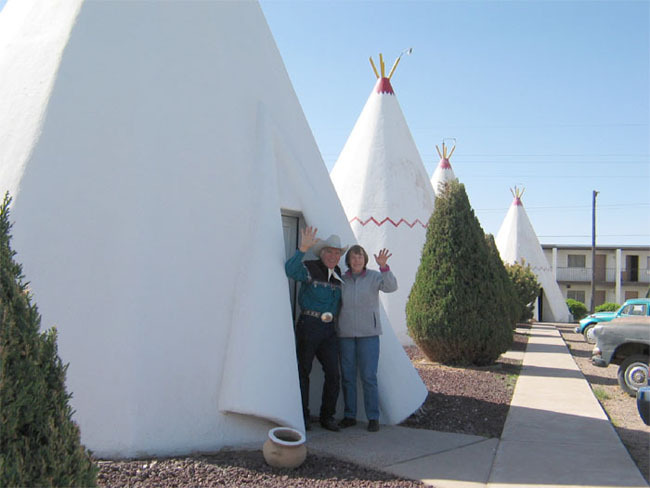 No one can say they have had the Route 66 experience until they have slept in a wigwam. With its simple but elegant graphics this sign has become a Route 66 icon. 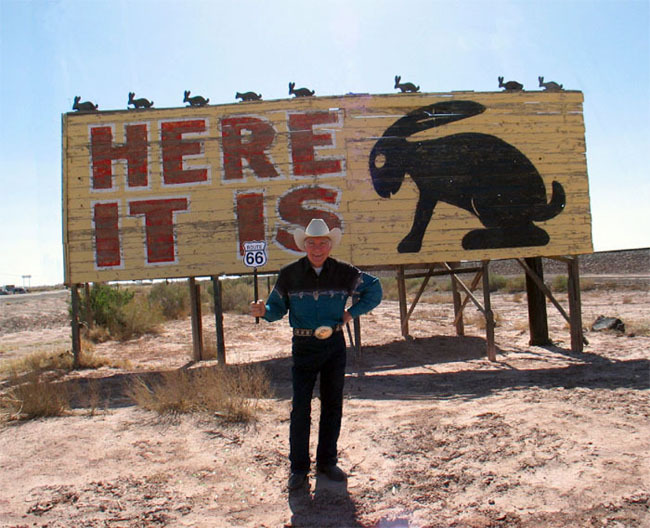 The “it” refers to the Jack Rabbit Trading Post, a small ramble of buildings across the road. When I stopped by to take this photo there was only one car parked out front. Meanwhile down the road at Geronimo’s Trading Post I saw twenty or so cars and two tour buses. El Rancho is a common name used for hotels and motels in America. 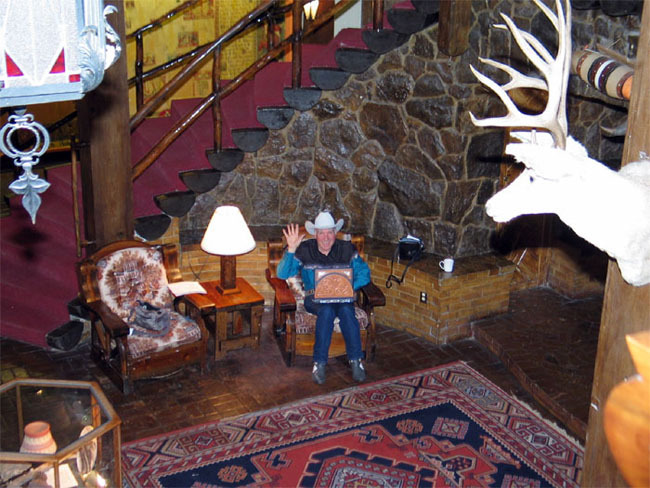 But the El Rancho Hotel on Route 66 in Gallup, New Mexico, is in a class all by itself. Built in 1937 during Hollywood’s golden era it was the hotel of choice for the many film stars working on location in the area. The lobby walls are crowded with their autographed photos. I think it’s worth the cost of a room just to spend an evening in the El Rancho’s magnificent lobby. Spotlessly clean and well decorated in a southwestern theme it is the most people friendly lobby I have seen in a long time. To be around people playing cards, talking, reading, smiling, in other words being totally human can lift the spirits of any weary traveler. Diners, along with Hot Rods, Harley Davidson motorcycles, Custom Cars, James Dean, Marilyn Monroe, have all become symbols of Route 66. 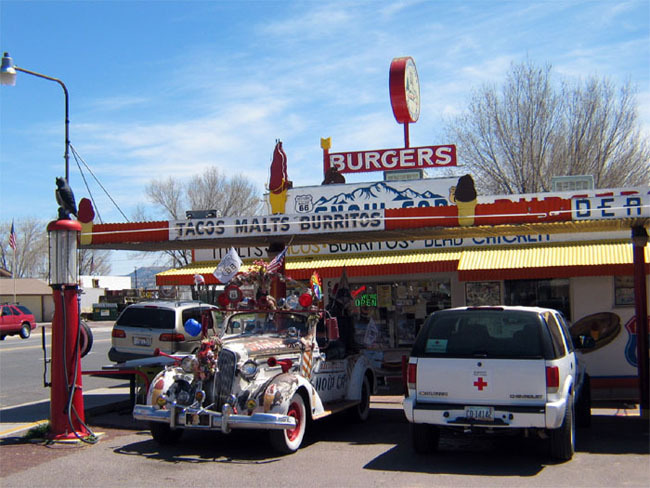 One of the best and most popular diners can be found here in Albuquerque, New Mexico. It’s called the 66 Diner. Its proximity to the University of New Mexico assures a steady flow of young teens as customers and waitresses so the feeling of America’s 50’s era is always there. Jill Fogerty, daughter of famed Creedence Clearwater Revival band member Tom Fogerty, worked here in the late nineties when she was a student at the university. This young waitress, ‘Books’ served me my hamburger, French fries and chocolate malt. 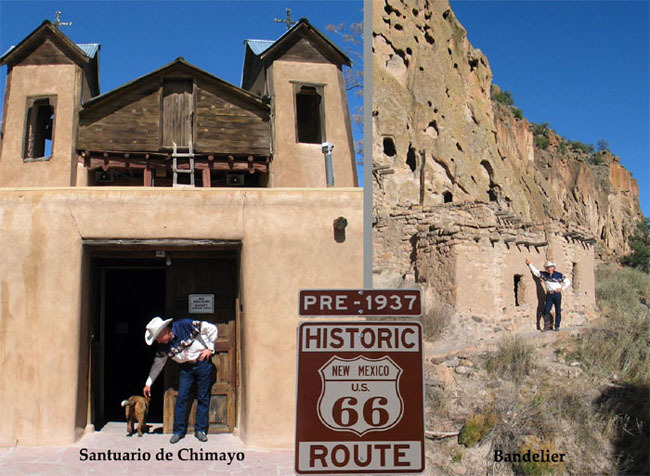 In Albuquerque, New Mexico, an older Route 66 extended north up to the second oldest city in the United States, Santa Fe. The leather jacketed Spanish soldiers moved into this area in 1598 and started a small settlement. In 1740 a small church was built here called Santuario de Chimayo. Legend has it that the soil around the church has miraculous healing powers. Pilgrims, and sometimes even dogs, still trickle in here to test the soil on their sore backs, legs and feet. A short drive to the east leads to the ancient cliff dwelling ruins at Bandelier that were occupied by the ‘Anasazi’ from about 1150 to 1325. These ruins are visitor friendly. I was able to climb up and stand alongside and ancient cliff pueblo made of timber, mud, and stone. 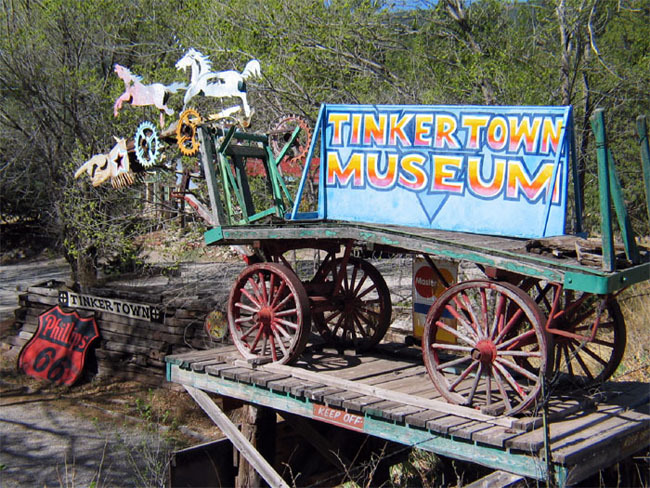 Just a few miles off Route 66 north east of Albuquerque, NM, is a wonderful folk art environment called Tinkertown. A lifetime of ‘tinkering’ by Ross Ward is on view here and is a delight to behold. Ross passed away in 2002 but his wife Carla keeps the gates open and welcomes visitors from all over the world. 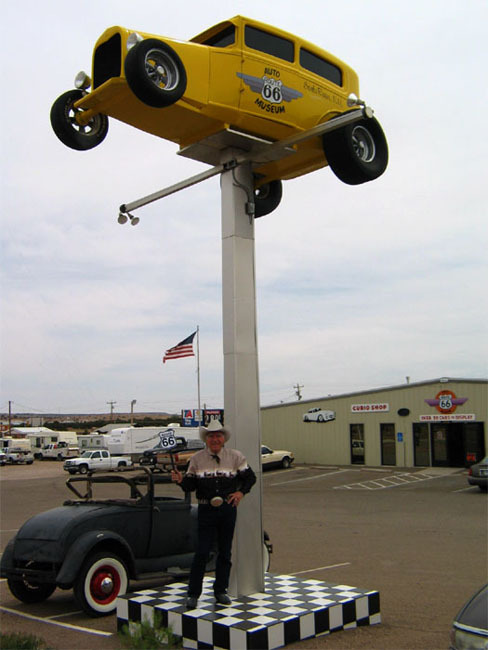 The Cardova Family has put together a small museum on Route 66 here in Santa Rosa, New Mexico, called the 66 Auto Museum. Over thirty vintage and custom cars plus some hot rods fill the back half of the museum. The front half is filled with 50’s memorabilia and Route 66 souvenirs. Their ‘Car on a Pole’ sign out front harkens back to the time when gimmick signs like this were a staple on the Mother Road. It’s very appropriate and it’s nice to see some imagination and creativity popping up again on 66. New Mexico has a wonderful Art in Public Places program. The art on some of its freeway overpasses and highway dividers is spectacular. 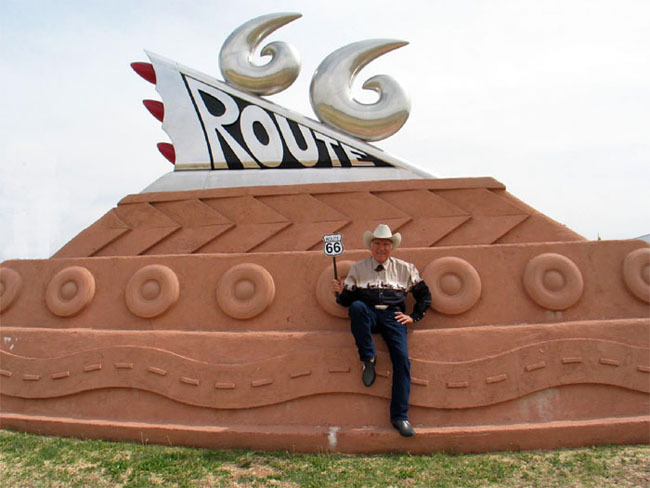 Even here in this small town of Tucumcari there is an abundance of public art, mostly murals, except for this sculpture which is right on Route 66. Unfortunately most of the murals are in parts of town tourists seldom venture into. I would have missed them myself if it wasn’t for a friendly local who told me where they were. Locals are always the best source for information along 66. 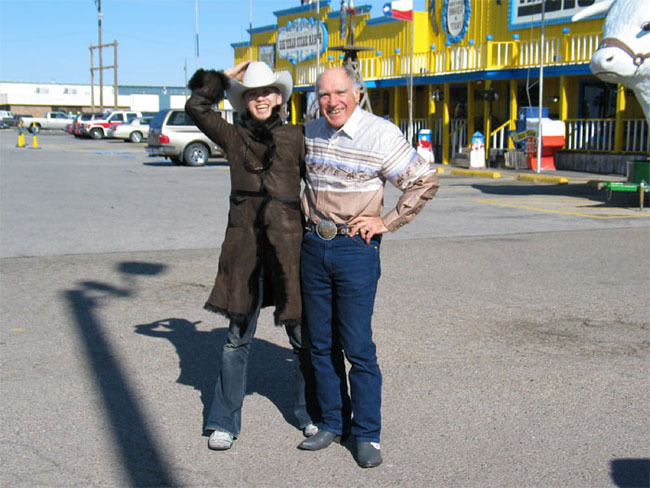 Texas is the state most people think of when they see a cowboy, even though the people who built the cowboy image, people like, John Wayne, Gene Autry, Roy Rogers, Clint Eastwood, all live or lived in California. But for whatever reason, the American cowboy will always be linked to Texas. And since the death in 1953 of America’s number one cowboy singer/songwriter, Hank Williams, in the back seat of his Cadillac, modern cowboys will always be linked to Cadillacs. Every cowboy I know either had one, has one, or wants one. 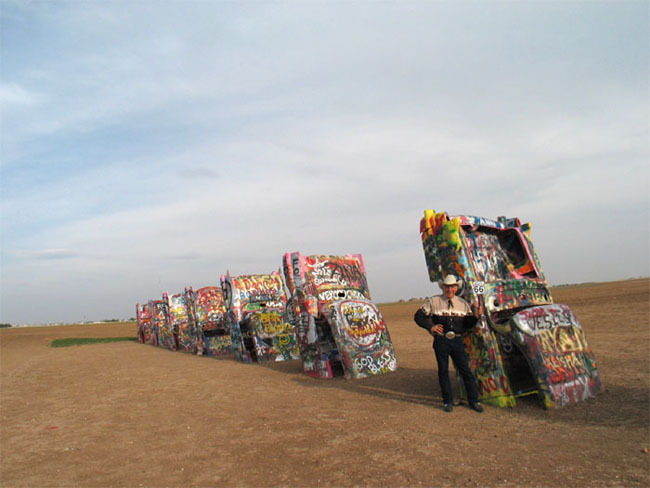 It’s only fitting then that Cadillac Ranch, America’s second most recognizable public sculpture, (Mount Rushmore being the first) should be located in Texas...Amarillo, Texas, to be exact, right on Route 66. There are several 66 museums along the Mother Road. And although foreign tourists may find them interesting I personally am not overly impressed with the old cars and diner mockups you see in most of them. I’ve seen all that stuff before. What I do like about Route 66 museums, and especially this one in Clinton, Okalahoma, are some of the old photos of workers working on the road. It all seems so primitive. It was really a huge undertaking to pave a 2,400-mile road from Chicago to L.A. I also like the 66 souvenirs these museums sell. If you have traveled the Mother Road from Chicago to L.A. it’s nice to have something around the house to remind you of that great adventure. Oklahoma City is mighty pretty...if you’re a cowboy. 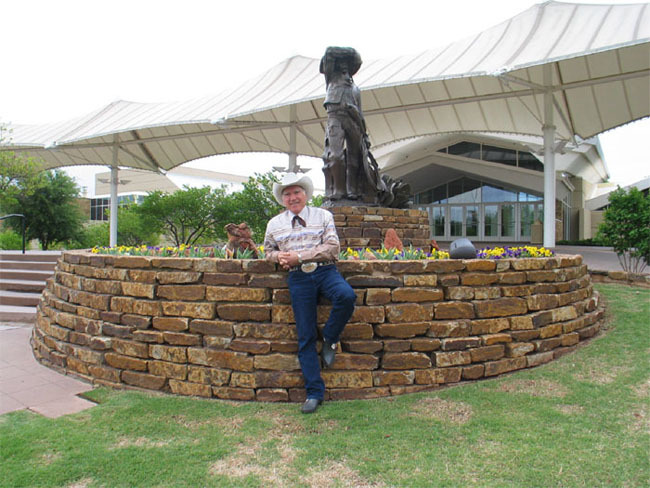 Okalahoma City is the home of the National Cowboy & Western Heritage Museum. 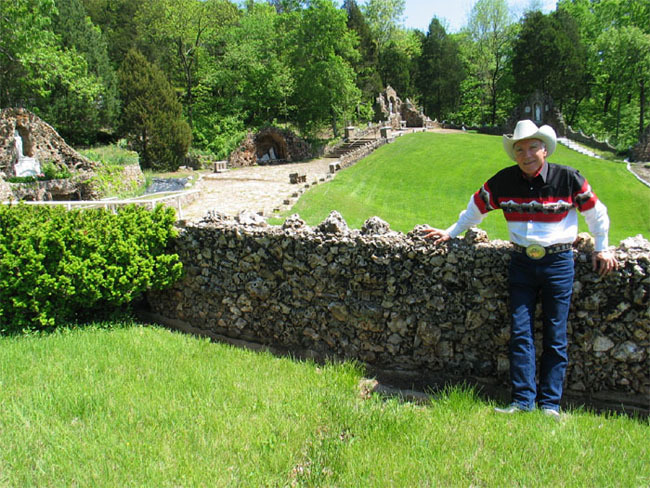 It is America’s most complete museum dedicated exclusively to the American Cowboy. 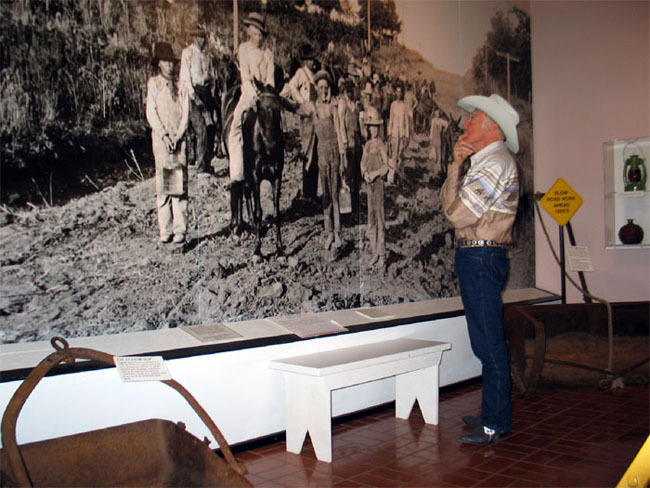 Western artists, rodeo, movie, and working ranch cowboys, along with their gear, history, and legends are represented in this large well-appointed museum. I totally recommend it. 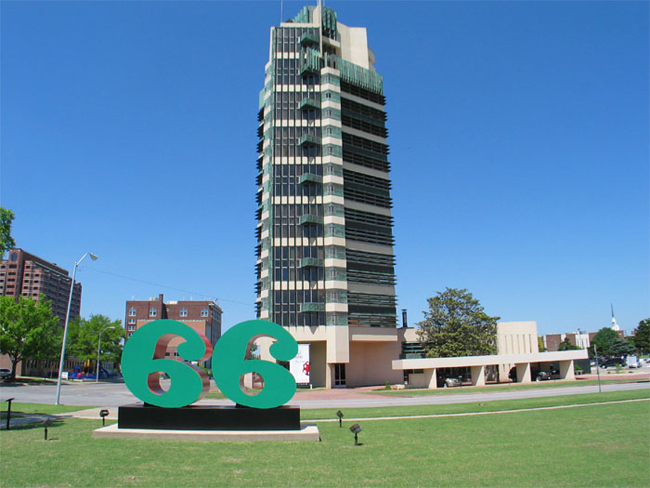 A thirty-minute drive north of Tulsa, Oklahoma, off Route 66, is the small town of Bartlesville. Out here in the middle of nowhere I found the only skyscraper designed by America’s most famous architect Frank Lloyd Wright. It’s called the Price Tower. I had no idea it was out here. I have been to many Frank Lloyd Wright buildings in California as we have a number of them, but this was a rare treat for me to see this magnificent structure just a short drive off the Mother Road. 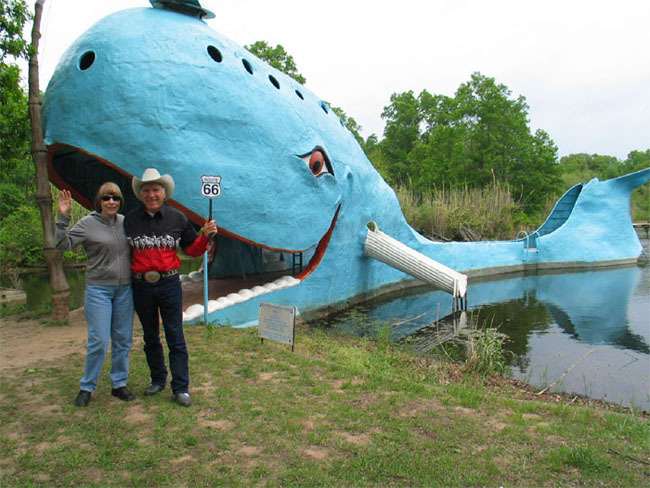 The Blue Whale was once an amusement park back before Walt Disney showed us how it’s done. It’s almost comical to look at this pathetic looking poorly built structure and think it was someone’s idea of an amusement park. Someone thought they could make a buck by pulling people off Route 66 for a dip in what was probably a contaminated pond. The interstate put that dream to rest in short order. Americans have always tried to turn a buck on ideas and dreams no matter how outlandish they are. Route 66 is a testimony to that. Even though the Blue Whale dream is gone and the amusement park abandoned, a small group of people still dab the Blue Whale with a fresh coat of paint now and again for the tourist who stop by for a photo. Joplin, Missouri is the hometown of internationally known sculptor and mail art artist Tyler James Hoare. 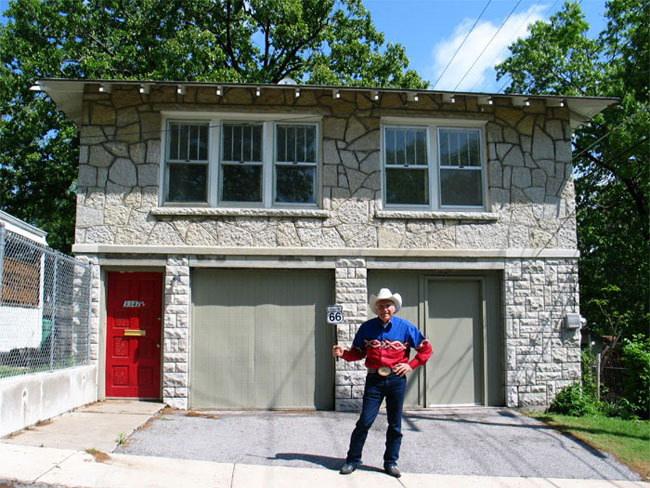 Tyler tells me that this house, near the corner of 34th and Oak Ridge Drive, was the site of a shoot-out in 1933 between the Joplin police and the infamous outlaws Bonnie and Clyde. You may remember the shoot-out in the 1967 film, Bonnie and Clyde, with Warren Beatty and Faye Dunaway. After killing two policemen Bonnie and Clyde roared out of Joplin on Route 66 heading for Texas—where a year later they were ambushed and killed themselves. 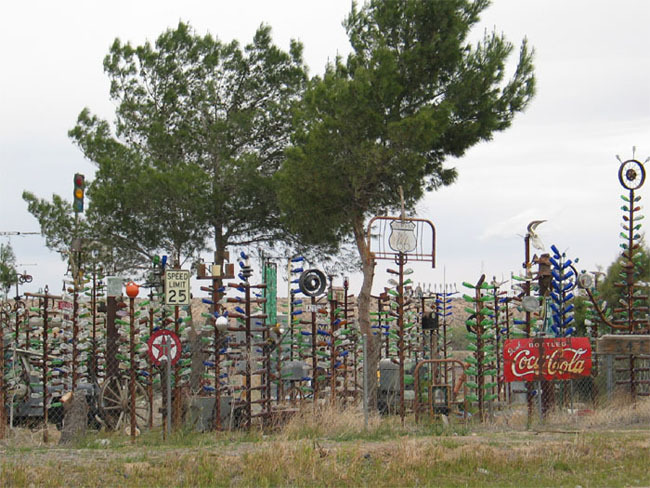 All along Route 66 you will find many examples of folk art. It can be something as elaborate as this bottle forest or something as simple as a funky painted mailbox. Look around for them as you drive through the small towns and rural areas, you won’t see anything like it on the Interstate that’s for sure. In 1927, a year after Route 66 was commissioned, a small group of Franciscan Brothers emigrated from Poland to this Franciscan Mission here in Eureka, Missouri. One of those brothers, Brother Bronisalus, was obsessed with an old candle darkened painting of Mary, called the Black Madonna, which he’d seen as a boy. As soon as he arrived at the mission he began to build a shrine to her. 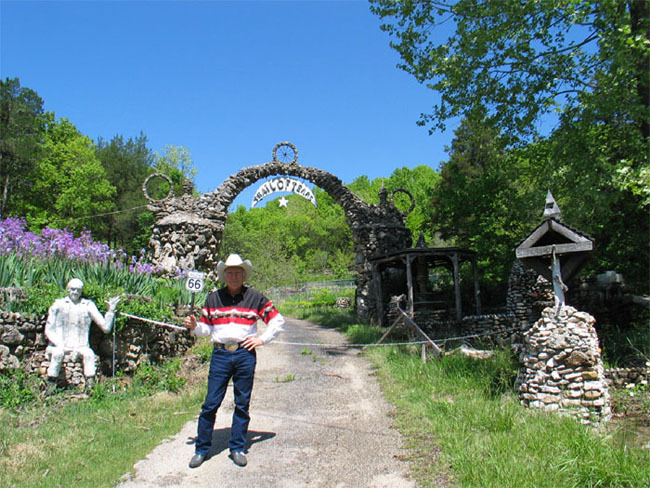 Working alone with nothing but Missouri tiff rock and his bare hands he built this amazing folk art environment. It’s called the Black Madonna Shrine and Grottos. This folk art piece, like most folk art pieces around the world, is interlaced with religious images, icons, and relics. For some reason God or salvation is the prime motivation for many folk artists. But even so, as an artist, I find this, and most all other folk art environments, amazingly creative and worthy of higher intellectual consideration. Like Watts Towers or Salvation Mountain in California, the Black Madonna shrine is a must see for any artist traveling the Mother Road. This Folk Art Environment is near the town of Arlington, Oklahoma. All I was able to find out about it was that the person who created it passed away some time ago. I could see that there was a lot more stuff up the road but the sign said ‘Keep Out’. My guess as to the motivation for this project was the forced march of Native Americans in 1838 from an area around Georgia to reservations in Oklahoma known as the Trail of Tears March. Over four thousand men, women, and children died at the hands of unsympathetic Army generals during this thousand-mile march. 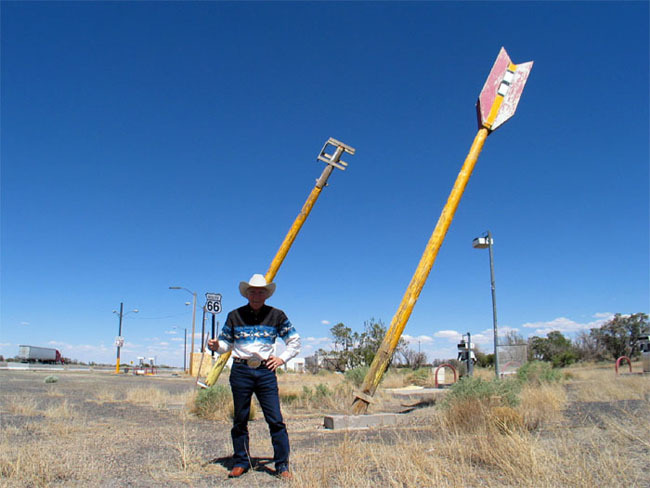 Often times as you travel Route 66 you will find yourself lost or confused as to where to find certain attractions you’ve read about. My suggestion is to ask a local. 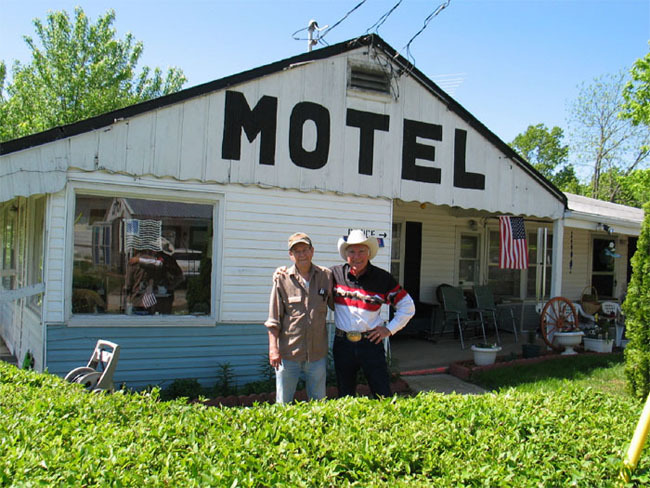 I found that local folks are more than eager to help you locate some small motel or old filling station. Chances are they’ll ask you to “sit a spell” while they tell you some interesting bit of information you won’t find in your Tourist Guide. Ed, here at Vernelle’s Motel, helped me find the Trail of Tears Folk Art Piece. Now and then you see the remnants of someone’s dream rotting in the underbrush. This once proud motel on Route 66 is now only a reminder of the realities of a capitalist society... every potential for success carries with it the possibility of failure. These rotting structures are a reminder that dreams have no safety net—there is always the risk of failure from sources beyond ones control. 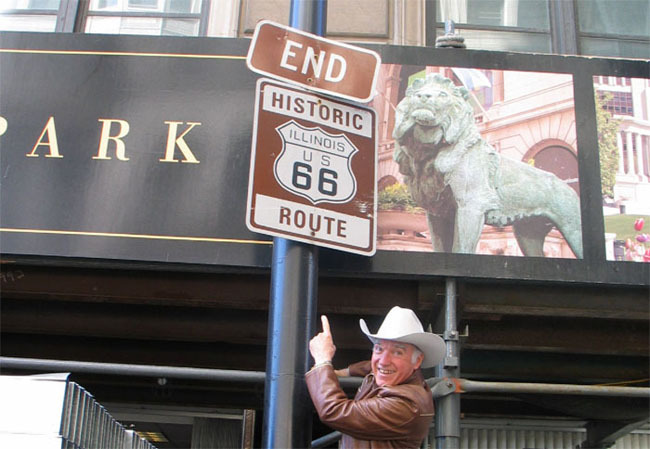 Route 66 has always been a highway of dreams, not only for those who tried to profit from it but also for those who now come to drive on it. This is one place that lives up to its reputation. 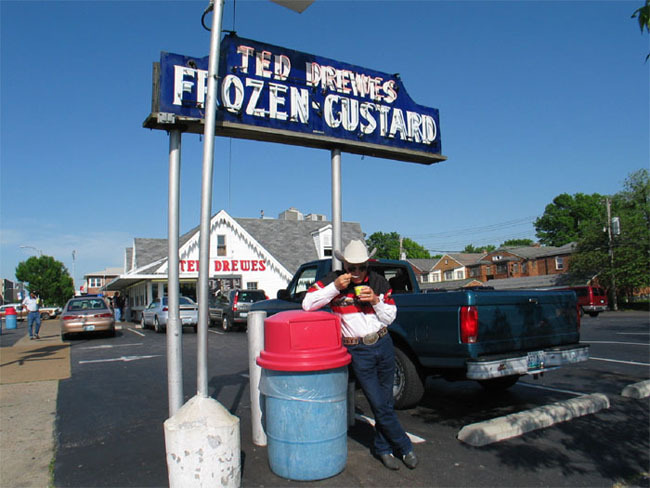 Ted Drewes Frozen Custard stand in Saint Louis, Missouri, serves up the very best frozen custard in the world. I had two ‘concretes’ that are so thick they hand them to you upside down! 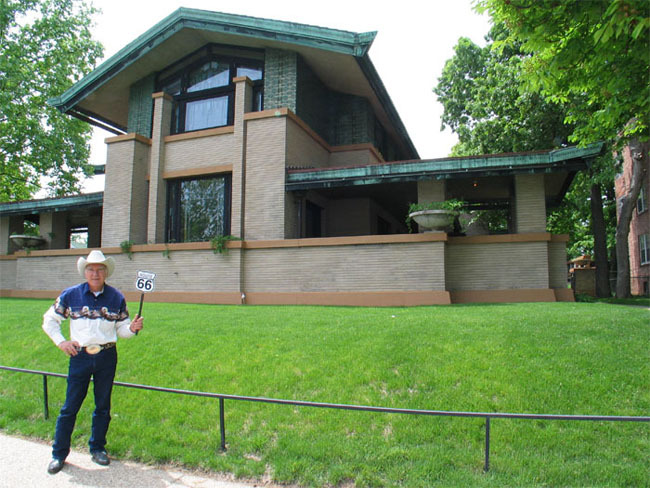 Just a few blocks off Route 66 in Springfield, Missouri, is another Frank Lloyd Wright house; the Dana House. This house is probably the best example of Wright’s early work. Meticulously restored, it features original Wright designed furniture, including light fixtures, lamps, and stained glass windows. They offer tours and are well worth the time. The Cozy Drive In in Springfield, Illinois, is a Route 66 institution. Known as the home of the famous ‘Cozy Dog’ it’s a must stop on the Mother Road. You can usually find owner Sue Waldmire and long time customer pal Mal sitting at the head table. 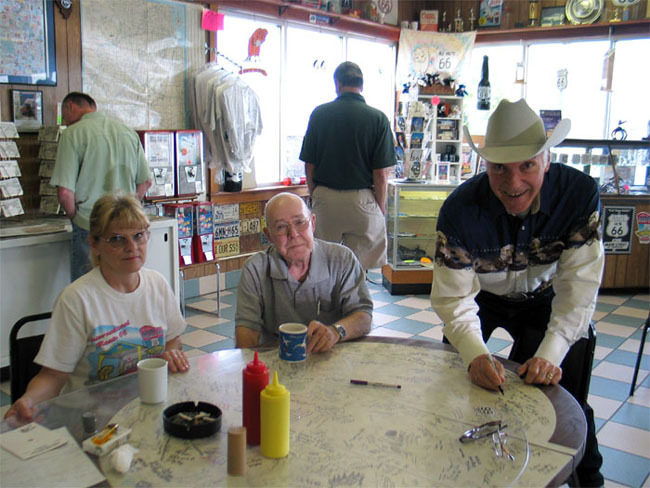 Sue signed my Route 66 boots and then slipped back the glass tabletop cover so I could sign her table. Just south of Chicago right on Route 66 is Funk’s Grove, home of Funk’s Maple Sirup. This is a family owned, family operated and family friendly establishment that produces the gold standard for maple syrup. I’ve never tasted better maple syrup. Stop by for a sample and you’ll see what I mean. It’s sooo good! While I was there I had the pleasure of meeting Akio Takeuchi. 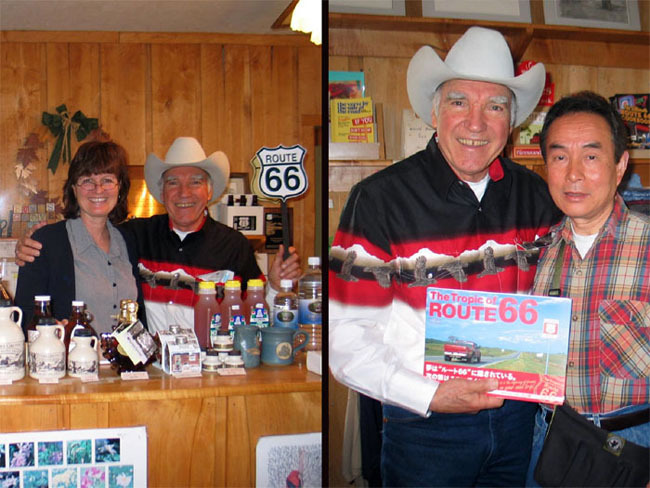 Akio is from Japan and he has published two books on Route 66; “The Tropic of Route 66” and “The Mother Road & The Native Road of America”. Sixtysixer Akkey has been roll’n down 66 since 1994 and has logged an impressive sixty-six thousand miles on the Mother Road. The end of the road. 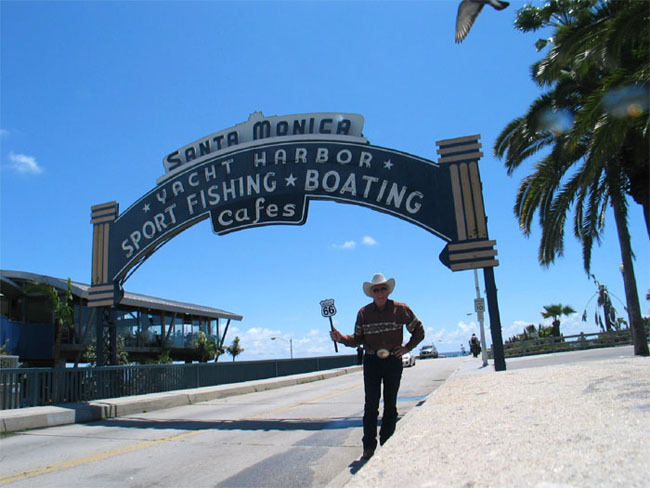 From Santa Monica to Chicago...over two thousand miles all the way. Even though its pavement is a little rough in spots and it leads you through some areas that have seen better times the Mother Road is still a magical road, a spiritual highway full of wonderful sights and wonderful people. Route 66 has become a vibrant, living, growing patch of asphalt that stretches across this great land. And because of the fascination with Route 66 around the world, it is no longer just America’s highway; it is now the world’s highway. A note on Chicago. Route 66 ends (or begins) at the Art Institute of Chicago. A fitting place for me, as an artist, to end my journey. I was able to top off my trip by looking at one of the best impressionists collections in the country. Chicago also has a lot of good architecture to see. There is an abundance of Frank Lloyd Wright’s work including his home and studio and the Robie House which is a must see for any student of Frank Lloyd Wright. Tours are available at many of these architectural gems. Chicago is a beautiful and clean city with lots of good restaurants and much to see and do. Plan to spend some time there.